If spectacular mountain and valley views and space, is what you are after, then 6 bedoom Villa Tarrac is for you. The large pool and BBQ house, featuring a dining area and kitchen, are perfect for alfresco living. What's more, the Arenal area of Javea with a sandy beach, and plenty of bars, restaurants and shops is 10 minutes' drive away. WiFi, pool heating and air conditioning/heating in the bedrooms and lounge are included. The picturesque views and generous outdoor living space with a large private pool plus excellent BBQ house and facilities. Great choice! The large pool is the star of the show at this villa - it's a great place to sit around with a good book, admire the mountain views and take a dip to cool off in between. There is a covered terrace, perfect for a siesta. The fabulous poolside BBQ house, designed for alfresco living, has a summer kitchen and dining area with 2 BBQ's, an oven, hob, fridge, as well as a shower and WC. There is off road parking for your hire car with a few steps leading up to the covered terrace and front door opening into the kitchen. More steps from the entrance lead you down to the pool. You can also access the villa from the covered terrace at pool level. The lounge/dining area is flooded with lots of natural light from the patio doors and windows. You can relax on comfortable seating or at the dining table and chairs overlooking the splendid mountain and valley views. There are patio doors leading out onto the balcony and round to the spacious open terrace. The fully equipped kitchen with a small breakfast table is adjacent to the lounge/dining area. The pool level has 1 twin bedroom with an en suite shower room, and 2 double bedrooms, both with en suite shower rooms. These rooms all have direct access to the covered terrace by the pool. On the ground floor, there are a further 3 bedrooms - 1 double and 2 twins. One of the twins has an en suite shower room as well as patio doors out to the terrace whilst the double has access to an open patio. There's also a separate shower room. This villa is registered and licenced by the Generalitat Valenciana to comply with local legislation on holiday rentals. This number is: AT-454938-A. 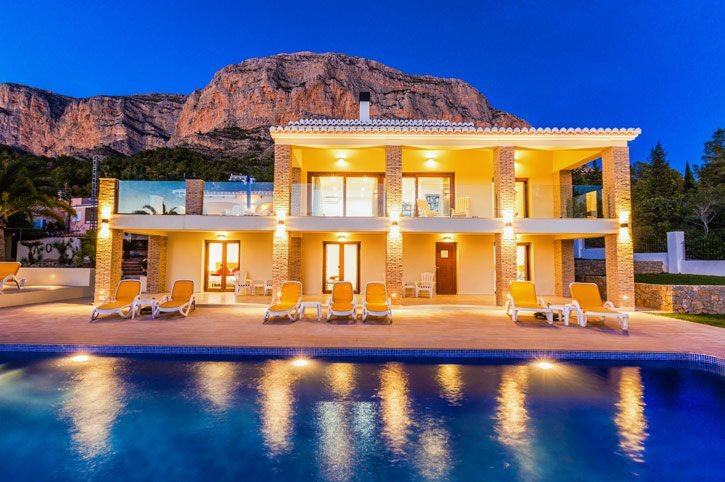 This villa is set on the slopes of the Montgo mountain in Javea, with wonderful views of the mountain and the valley. It's less than 5 minutes' drive to several restaurants and a great mini market with organic meat and the best butcher in town. Or the Arenal area is 10 minutes' drive away, with a sandy beach, the artesan stalls during the summer months, bars, restaurants, shops and a small nightclub, which is partially open air. You'll find plenty of shops on the Arenal area to browse. Plus, there are several markets nearby, with the Sunday market in Jesus Pobre, 3 miles away, offering a great selection of local and organic goods. There are also markets in Denia on a Monday morning and Javea Old Town every Thursday. Or, by the church in Javea Old Town, there's a daily morning indoor food market with many locally sourced items. Javea is split into 3 areas - the Port, the Arenal and the Old Town. You will find many bars and restaurants in all 3 areas offering a wide variety of cuisine to choose from. Alternatively, Denia around 15 minutes' drive away, is a larger town with more bars, restaurants and a couple of nightclubs. Javea offers the gently sloping sandy beach of the Arenal and a plethora of rocky and stony coves to explore such as La Grava near the port. Alternatively, Denia offers huge stretches of sandy beaches, where you can choose to be close to the action or away from it all. There are plenty of activities in the vicinity including tennis, go karting and crazy golf. Karting Javea also has a restaurant, pool and bouncy castle. Or try Paris 24 Tennis Club and enjoy lunch and a dip in the pool, or play tennis and paddle tennis. Javea Old Town has a museum, where you can climb up to the roof terrace for amazing views. Denia is also worth a visit to its ancient castle, perhaps stopping for a cool drink down it's tree lined main street. There is a golf club open to the public near Benitachell, as well as a course at the Marriott Hotel and Spa just a short drive away. There are plenty of marked walks to explore in the Montgo Mountain National Park, although it's wise to avoid the hottest part of the day. Villa Tarrac is not available to book for season as it is sold out. Take a look here at the Costa Blanca villas that are currently on sale. Karting Javea/Laguna Ribs is fun for all the family, a karting track offering different power karts so everyone can race, a pool, a bouncy castle (weather permitting) and a bar/restaurant with occasional live music.